Our ability to do this has come from years of real experience. We have been involved in the real operations of medium sized players through to sizeable operations with one simple objective in mind – to drive profitable growth. From our hands-on experience we have developed a strict set of management strategies and models that deliver profitable growth across a broad sector of industries – product and service based. Strategies focus on providing a clear plan on how to articulate and deliver our clients’ definition of profitable growth. 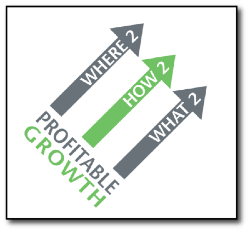 We work with clients to define Where2© POSITION to find their profitable growth and then on How2© ALIGN RESOURCES to achieve it and What2© MONITOR to drive it. Here we offer access to a range of skills to assist our clients, through an independent set of eyes; on Where2© POSITION to Find Profitable Growth. Our methodology helps our clients to clearly define how they want to be seen by knowledgeable stakeholders in the future, and support this vision with embraced core values that assist our clients to define their strategic purpose, or answer the question “why are we here?”. Our experienced consultants work with key teams and key individuals to play to their strengths and systematically improve performance, by helping our clients on How2© ALIGN RESOURCES to deliver the strategic plan. We establish performance measures to track the drivers to profitable growth for your business, and ensure you have access to the right information, when you need it. "This program has resulted in both the Board and Management being focused more than ever on the key tasks and activities so essential to compete and remain viable in today's competitive financial environment. Clear, measurable objectives, goals and tasks have been set as we face the challenges placed upon us."